Blueberries are in season now here in the States and they’re plentiful and cheap. They’re also ridiculously good for you, but that’s really beside the point — what matters is that they taste so good! 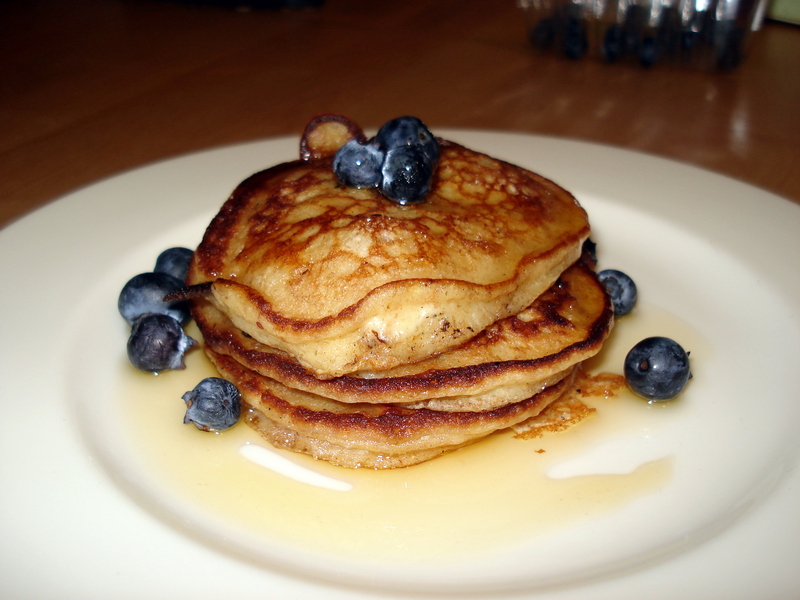 It’s hard to believe that they can taste better in any way other than plain from the punnet, but these pancakes bring out the blueberry flavour very well and they melt in your mouth. I really should whip up a batch of these again. Soon. I got the original recipe here, but I’ve modified a fair bit. But give credit where credit is due, right? Because blue and orange is a good combo. Sift together flour, baking powder, baking soda into a bowl. Set aside. In a separate bowl, whisk together the eggs, sugar, yoghurt, orange juice, and melted butter. Add the blueberries to the wet ingredients, then add the dry ingredients into the wet. Do not over-mix. Cook batter in a skillet over medium heat. Serve topped with a bit of butter and some syrup (maple is amazing) and fresh blueberries. ← The 4th of July! Sounds yummy! I will definitely try them. By the way, thanks for having Tim over. Mmmmmm. That’s it. We are not moving out. You guys can just move back in and we can cram in together. Then you can make lots of yummy things for us to eat…. and I’ll… um… clean?